Reference number for this case: 22-Oct-54-Guéthary. Thank you for including this reference number in any correspondence with me regarding this case. French ufologist and author Jean Sider discovered in the regional newspaper Sud-Ouest an anonymous letter from a reader published on October 26, 1954. The author of the letter claimed that on October 22, 1954, at 11:00 p.m., he was walking on the jetty of the beach of Guéthary, when he was "literally paralyzed" by the strange display of a weird machine that arose from the sea. It was a disc with three or four projectors that emitted a greenish light. The craft suddenly re-entered the waves, and the witness could see its glow under the water, moving away, until the craft emerged from the waves at 200 or 300 meters, to fly away and "disappear" at high speed. The observation reportedly lasted 20 seconds. Jean Sider discovered in the newspaper Sud-Ouest a letter by an anonymous reader that this newspaper published on October 26, 1954. The author of the letter reported that on October 22, 1954, at 11:00 P.M., he walked on the pier of the beach of Guéthary, when he was "virtually paralysed" by the strange display of an odd machine which emerged from the sea. The apparatus was a disc equipped with three or four projector which diffused a greenish light. The machine then suddenly pluged in the water, and the witness could see its gleam under the water, which moved away, until the machine rose from the water at 200 to 300 meters, to fly away and disappear at high speed. The observation is said to have lasted 20 seconds. Beach: Nautical UFO. Disc emerges from ocean. Had 3-4 beams of light. Dives, illuminates surface of water. Ascends and flies away. The witness was walking along the jetty at Guethary Beach when, he claims, he was literally paralyzed by a strange sight. A bizarre machine suddenly emerged from the sea. It was a disk with three or four beams diffusing a greenish light. Suddenly the machine plunged into the waves. The witness saw a glow under the water which moved away only to be seen again farther out, at about 200 or 300 m. Finally, the machine flew away disappearing at high speed. Duration of the incident: 20 seconds. Note: This is a summary of a letter from a Sud-Ouest reader whose identity was not given. (per researcher, Jean Sider). 1954 - At 11:00 p.m. a disc-shaped object emerged from the ocean off the coast of Guethary, Pyrenees-Atlantiques, France. When it dove down it illuminated the surface of the water. It then made a final ascent and flew away. (Source: Larry Hatch, U computer database, case 4040, citing Jean Sider, Dossier 1954 et l'Imposture Rationaliste, p. 118). Luc Chastan indicates that in the Pyrénées Atlantique in Guéthary on October 22, 1954 at 23:00 "The witness walked on the pier of the Guéthary beach, when he was 'literally paralysed' by the strange display of an weird craft which emerged from the sea. The machine was a disc provided with three or four projectors which diffused a greenish light. The machine then suddenly dove again in the water, and the witness could see its gleam under the water, which moved away, until the machine arises from the water at 200 or 300 meters, to fly away and disappear at high speed. The observation reportedly lasted 20 seconds." 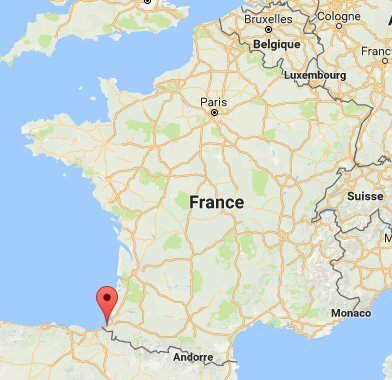 The website indicates that on 22 October 1954 at 23:00 in Guethary, France, "Nautical UFO. Disc emerges from ocean. Had 3-4 beams of light. Dives, illuminates surface of water. Ascends and flies away." And: "An unusual object was sighted, that had unconventional appearance and performance. One disc was observed by one witness on the shore for over one minute. " *Oct. 22, 1954 - At 11:00 p.m. a disc-shaped object emerged from the ocean off the coast of Guethary, Pyrenees-Atlantiques, France. When it dove down it illuminated the surface of the water. It then made a final ascent and flew away. (Source: Larry Hatch, U computer database, case 4040, citing Jean Sider, Dossier 1954 et l'Imposture Rationaliste, p. 118). 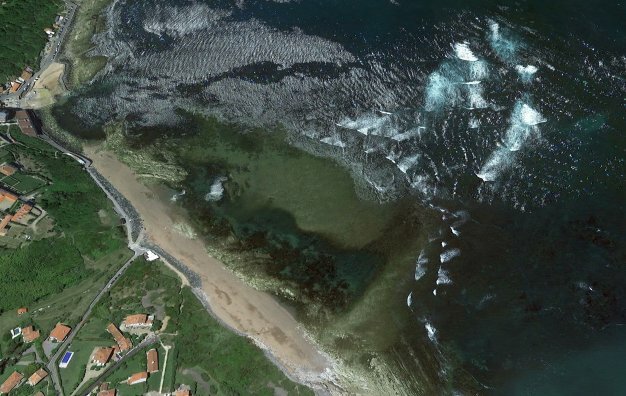 Above: aerial view of the jetty of the beach of Guétary. Guéthary, in Basque "Getaria", is a commune of the department of Pyrénées-Atlantiques in the Nouvelle-Aquitaine region. Former whaling port then tuna and sardine port, it is now a small seaside resort of the Basque coast. I do not see any trivial explanation that could account for what was described. Unfortunately it is only an anonymous, unverified letter, the original text of which is not available to me at the moment, and the credibility of the narrative is therefore completely unknown. [---] Reader's letter in the regional newspaper Sud-Ouest, Bordeaux, France, page 2, October 26, 1956. [js1] "Le Dossier 1954 et l'Imposture Rationaliste", book by Jean Sider, Ramuel publisher, France, page 119, 1997. [wu1] Case record on www.waterufo.net, website by Carl Feindt, USA, circa 2004. 0.1 Patrick Gross January 15, 2006 First published. 1.0 Patrick Gross January 14, 2010 Conversion from HTML to XHTML Strict. First formal version. Additions [dj1], [lc1], [ud1]. 1.2 Patrick Gross March 10, 2017 Additions of the Summary and Notes. Explanations changed, were "Not looked for yet". 1.3 Patrick Gross December 28, 2018 Addition [lh1].